Suspected National Liberation Front of Twipra (NLFT) militants served extortion notices to three panchayats under Raishyabari block of remote Dhalai district of Tripura. 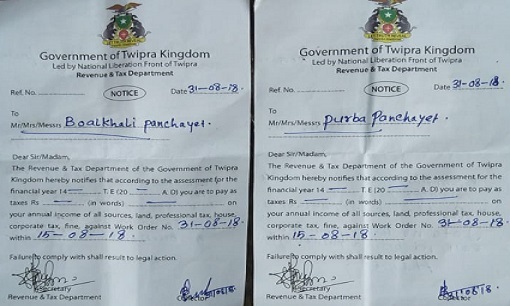 The notices were issued by revenue and tax department of NLFT in the pad of ‘Government of Twipra Kingdom’ to Boalkhali panchayat, Purba panchayat and Raima panchayat of Tripura. The outfit has imposed land tax of Rs 200 and house tax of Rs 300 per house. Besides, the business and corporate houses will have to pay 2% of tax. For transportation of vehicle the outfit has imposed Rs 10,000 as tax for one year. 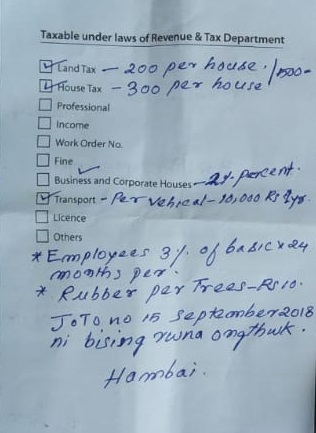 Apart from this, the government employees will have to pay 3% of their basic salaries for one year.